This book is a compellation of masterpiece quilts and step-by-step instruction to guide you in adding McTavishing to your creations (includes DVD). 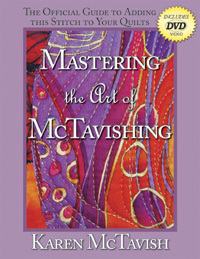 Mastering the Art of McTavishing is Karen's most popular book with over 30,000 copies in print! This book is out of print but a used copy may be ordered from amazon.com. However, the new McTavishing book includes everything the original included plus more. Mastering the Art of McTavishing, showcases the author's signature stitch on Art and Apparel, Appliqué, Wholecloth, and Pieced quilts. Contributing quilters are longarmers, domestic machine quilters and hand quilters. The book includes a detailed 90 minute DVD* of Karen teaching the process, step-by-step, of McTavishing. McTavishing is the most popular new design concept in quilting. This innovative stitching technique is inspiring quilters from New York to Australia. The author's namesake stitch makes a quilt look and feel as if it has motion and texture. The inspiration for this style of quilting comes from Art Nouveau artist, Alfonse Mucha. Author, Karen McTavish, adapted Mucha's curvy, stylized art form into a free-hand background filler quilting design. The effect was electric on the quilting community and in judged competition. Quilters emulated her form and dubbed it "McTavishing." This book is a compellation of masterpiece quilts that highlight McTavishing in all its complex forms. Mastering the Art of McTavishing instructs the quilter on adding this technique to any quilt or garment, from traditional wholecloth to contemporary art quilts, for use by hand, domestic machine, or longarm quilters. Lessons from the author combined with interviews of accomplished hand and domestic machine quilters on the DVD* give the reader an unparalleled view of the quilting process. Every aspect of how to use McTavishing is compiled in the book and in the accompanying DVD*. The book is softcover, full color, 96 pages, includes a DVD*, and retails for $24.95. I just want to tell you how great I think your McTavishing DVD is. I have had the book for a long time but for one reason or the other I had not watched the DVD. Last Saturday I showed it to a group of domestic machine quilters. I think more than anything the DVD succeeds in giving confidence. It is the chuckles and chat (things that cannot be put into a book) when you make mistakes and how you can back out to correct it. Keep up the good work. I just wanted to tell you how much I enjoyed your book Mastering the Art of McTavishing. I ordered it online and received it this past weekend. I have never read a quilting book cover-to-cover, but in this case I did, straight through in one sitting. I was captivated by the technique and decided to try it this morning. I can only say you turned on a light bulb. I enjoy machine quilting (traditional sewing machine), but have always had a time thinking of the right style to use on my quilts. I've taken several machine quilting classes, but have always felt a little hung up by the "rules." I don't like planning my quilts. I just want to run with them. When I played with your concept on my "scribble quilt," I realized that all the patterns that made me feel most comfortable when I quilted before were now flowing out of the machine. I held it back too much before and tended to copy other people's motifs. Not realizing what I really enjoyed doing most. I didn't let my style show through enough. When I was practicing, I noticed that my quilting didn't look like yours even though I was using your technique. That was the most amazing part of it all. I have a quilt basted and ready for quilting. I know now how it will be finished. Thanks for the inspiration, Karen. The book, and most especially the DVD, teach a beautiful, fast, fun, and easy technique for machine quilting. I personally have never liked stippling as a background quilting design and so was very excited when I first saw a friend doing "McTavishing". In addition to the McTavishing design, Karen demonstrates about 6 other patterns including an amazingly graceful and fairly simple Victorian Feather. The book and DVD give you all the information you need to sit down and practice this technique and very quickly master it. I highly recommend it. I knew this book (w/DVD) was coming out and could hardly wait. I've been in awe of Karen's quilting work from the first time I saw her doing it. The book is filled with beautiful quilts in color, with background text for each; and an assortment of pics with diagrams on doing her McTavishing technique. But... for ME... the very BEST part is the DVD which is attached inside the back cover. Very lengthy and very detailed videos of Karen using her McTavishing via her long arm quilting machine, and verbalizing instructions for several different doodling designs (the sky's the limit), as well as beautiful heirloom feathers, all free-hand. There's also a segment working Karen's McTavishing technique with a regular domenstic home sewing machine. Karen says each person's McTavishing will have their own individual finger print on it. For ME, the DVD was worth the price of the book!! I'm really a visual person... I need to see something in action, and this provided all and more!!! This was a great book if you are in to non-traditional type quilting. The CD is very helpful because you can see how to create these stitches and you can watch it over and over again. My book came on Tuesday and I have not been able to put it down - I have read and reread it. As a newbie, I have lots of questions and I found so many good answers. I love the pictures of the beautiful quilts and the format of discussion used to involve the artist who did the piecing as well as the ideas and plans from the artist doing the quilting. I also watched the DVD and really learned a lot. It is kind of like "being there". I particularly enjoyed the section at the end of the DVD on the feathers - both freehand and from a drawn pattern. It is a wonderful learning experience and one that I will go back to over and over again. I got Karen's book last week and I think it is terrific. I love all the gorgeous quilts and the comments by the quilter and then by Karen. The DVD is very well done and Karen gives wonderful directions. I especially laughed when she did her "blooper." I found out what I was doing wrong with my McT'ing and I've got that mastered now. At the end Karen also gives a great lesson in Victorian Feathers..the bump bump method. I found out I wasn't "bumping" correctly so I practiced that technique, too. This book was great. It's a "How To" book with DVD that really explains what she is doing. You can watch the DVD & go through the book at the same time to reinforce the concepts. Great even for a beginner LongArmer like myself. I was going to take a class from Karen McTavish, but the class had to be cancelled and I had gotten the book so that I could understand what was going to take place. I still want to take the class at a later time, but now, I can be practicing and be more ready for it.